Join us in the Fireside Lounge to worship and pray for God's Kingdom to come in our church and city! If you are new to Taproot in the last six months please join us on March 31st, after the Gathering, in the Fireside Lounge. We’d love to get to know you better and also answer any questions you have about Taproot. Coffee will be provided. Join us in the Fireside Room to worship and pray for God's Kingdom to come in our church and city! Childcare will be provided! Every few months, we gather together for a breakfast feast. It is filled with delicious food, hot coffee, and awesome fellowship. The next breakfast feast is March 3rd at 9am in the Fireside Lounge. On February 6th at 6:30 in the Fireside Lounge we will be having our once a month prayer gathering. During this time we seek the Lord for his leading and flourishing in our lives, church, city, and to the ends of the earth. Childcare will be provided. 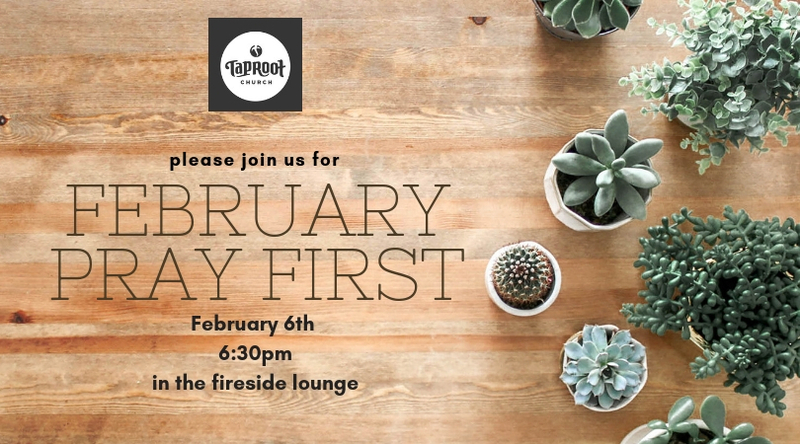 If you are new to Taproot in the last 6 months or so, please join us in the Fireside Lounge after the Gathering on January 27th for the Newcomer’s Coffee! We look forward to getting to know you better and answering any questions you may have about Taproot. There is no Sunday Gathering on Sunday December 30th. Enjoy the day with your family and we look forward to seeing you again on January 6th, 2019!